More dollars are moving to online, often at the expense of print, but the quality of online creative is highly variable and many online ads don’t work well enough to support their investment. A look at Quilted Northern, Lysol, Glade and Tide give us some perspective. For a look at how creative performs in other media types, see our resource page, "Integrated Marketing in All Media." 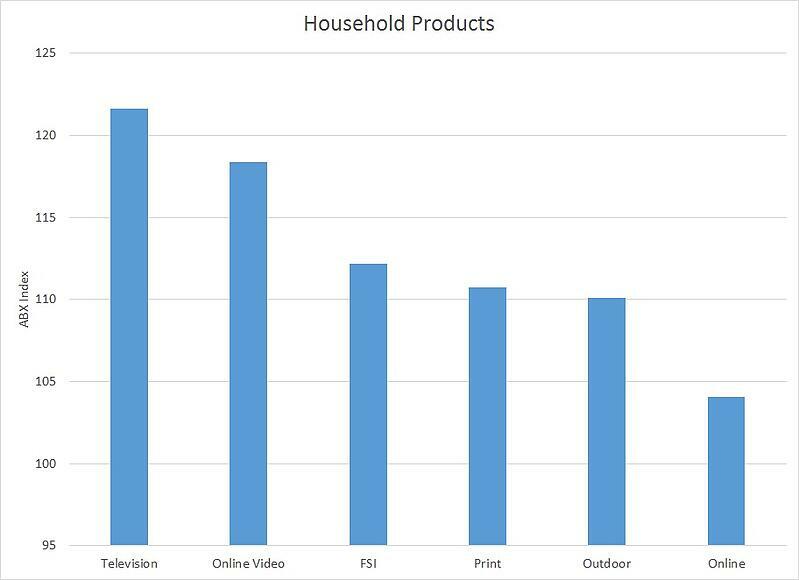 Online ads for the Household Products category have the lowest average creative scores of all media used by the category. 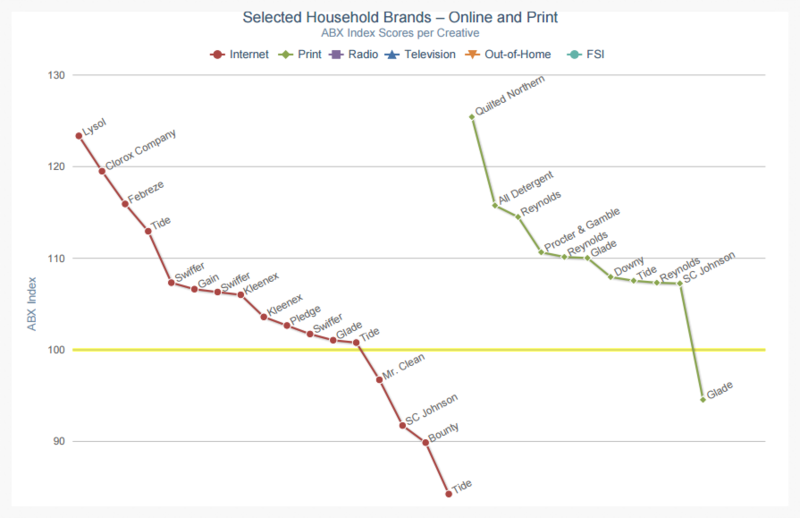 The chart below shows average ABX Index scores for Household ads in each media type. (An ABX Index of 100 is "average"). The “waterfall” chart below provides some additional perspective. As you can see, online creative goes from very good to very bad. Print is also variable, but most of these ads score above the ABX index 100. There’s a huge difference between Best & Worst ads….Let’s take a look at the survey results from the consumer panel. Best Ad - Online Display – Lysol with an ABX Index of 123 - which means this static ad was 23% more effective than the ABX average, which has been normalized against 100,000 measured ads. From the KPI breakouts, we see this simple ad was strongly branded, had a clear Message, left a better impression (Reputation) of the company after the ad was seen, as well as encouraged Action. Why? The coupon didn’t hurt, but the clear, effective headline shows old-fashioned, succinct writing still works. 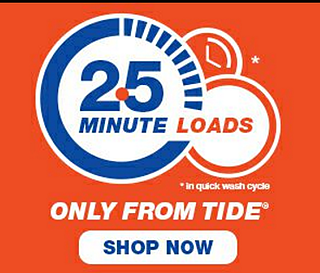 Worst Ad - Online Display – Tide with an ABX Index of 84 – which shows that this little ad from Tide, which makes perfect sense to me, didn’t make sense to anyone else! The ABX score means this ad is 16% less effective than average. It wasn’t noticed or understood, and did not help Tide’s Reputation or stimulate Action. We can be too terse these days and need to remember the customer can’t read our minds. Best Ad - Print Display - Quilted Northern with an ABX Index of 125 – yes, print still works just as well as online. This great ad says it all in the headline. How can the viewer not smile? Again, the coupon is a driver of this high ad effectiveness score, but without the “forgettable bathroom experience” line, it may not have been noticed. 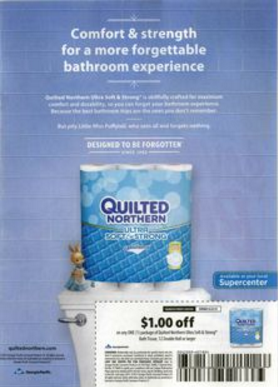 While humor doesn’t always work, it seems to have done well for Quilted Northern’s overall campaign. Look how strong the Message and Reputation scores are, not to mention Action. Worst Ad - Print Display – Glade with an ABX Index of 94 – which isn’t terrible, mind you, but it could be better. First of all, look at the ad closely. There is a hidden visual that is kind of cute. 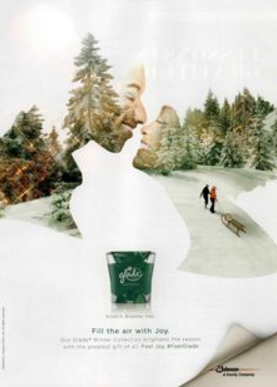 We *think* the ad is nodding to the fresh smells and romance of the holidays, but aren’t sure. Apparently no one else was sure what it said, either. If the Message is unclear, nothing good can come of it. So as you can see, there is a huge difference in creative performance. Knowing which ads are working and which are not and adjusting your investment accordingly pays handsome dividends.